Is Toast a Healthy Breakfast? Toast can be part of a healthy breakfast, but you'll probably need more than a simple piece of toasted bread to fuel all of your daily activities. Consider adding some other breakfast items to up the nutritional value of your morning meal. Making nutritious choices in the morning can help front load your day with nutrients to keep you functioning your best throughout the whole day. Toast provides carbohydrates and some fiber, depending on the type of bread used. However, toast is low in protein, fat and nutrients, so other foods will typically be required to make a healthy breakfast. In general, a healthy breakfast contains one or more servings chosen from dairy, protein and fruits or vegetables. When choosing toast for breakfast, consider the type and quality of the grain. Whole wheat toast, made from 100 percent whole grain flour, can provide fiber, vitamins, minerals and phytochemicals that are stripped out of the flour used to make white bread. For a change of pace, you can try toast made from a different type of whole grain bread, such as rye or spelt. 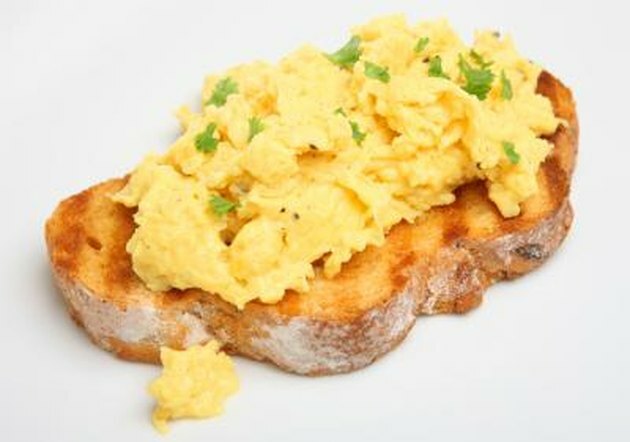 Adding egg or a slice of lean ham or salmon to your toast can provide protein that maintains energy levels and carries out cellular repair throughout the day. Fortified dairy products, such as milk, cheese or yogurt also provide some protein as well as valuable calcium and vitamins D and A without increasing your morning calorie count too significantly. A piece of fruit can increase the nutritional value of your breakfast meal and help to ensure a healthy breakfast. If your daily breakfast has consisted of toast lately and you want to try a different carbohydrate source, there are plenty of other options. A whole wheat English muffin or bagel can be eaten alone, with a simple topping such as cream cheese or peanut butter, or as the basis for a healthy breakfast sandwich. Croissants, biscuits and rolls are other alternatives to your morning slice of toast. When you are sick or recovering from illness, injury or surgery, a piece of toast may be all you feel like having in the morning. If a basic slice of toast seems to be all you can get down, getting those calories in is better than nothing. To improve the nutritional quality of your recovery breakfast without adding foods that might make you feel queasy, try adding a little applesauce or banana, as these foods tend to be easy on the stomach. Is a Bagel a Healthy Breakfast Food? What Is Considered a Healthy Breakfast?